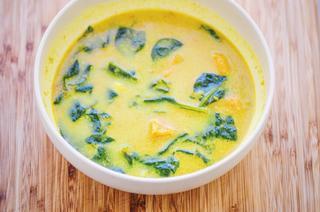 A simple, easy, healthy, and delicious sweet potato and spinach coconut milk soup. Gluten-free & vegan. All food is medicine--but there is something about soup that feels more blatantly medicinal to me. When I make a soup, I really intuit all ingredients based upon what is needed in the moment. In a large pot, heat oil over medium heat. Add garlic, sweet potatoes, spices. Cook a few minutes while stirring.Add vinegar & water and turn heat to high until boiling. Reduce to a high simmer. Cook 30 minutes.Stir in spinach, coconut milk, & sugar. Cook for 5 minutes more on high heat. Turn off heat, cover, and let sit for a few minutes before serving.